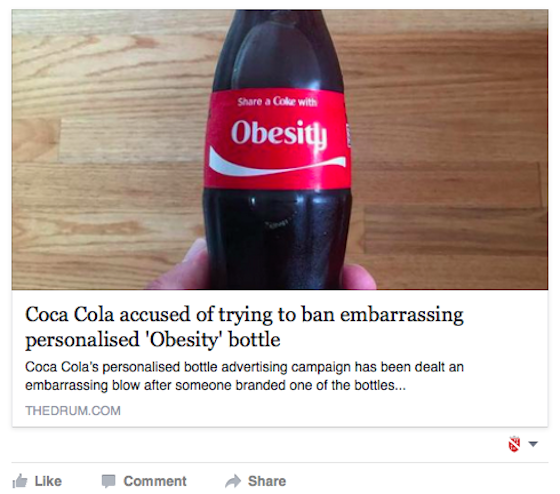 You could not, however, share a Coke with “Obesity,” “Diabetes,” or “Tooth Decay.” No big surprise. So we thought we’d make a video about that – about how shareacoke.com won’t allow labels to bear the names of some of the problems associated with the overconsumption of sugary beverages. But the site also allows users to submit names or words that might be missing from their database. So to keep things on the up-and-up, we submitted the word “Obesity” just to see what would happen. What happened next meant we had to start over and rewrite the video a few times, but each time it kept making the story more fun. Interesting epilogue: about a week after we released this video, the word “Honesty” was also removed from the list of approved words on shareacoke.com. See story from The Drum on Today.com on Digiday and on Mashable.